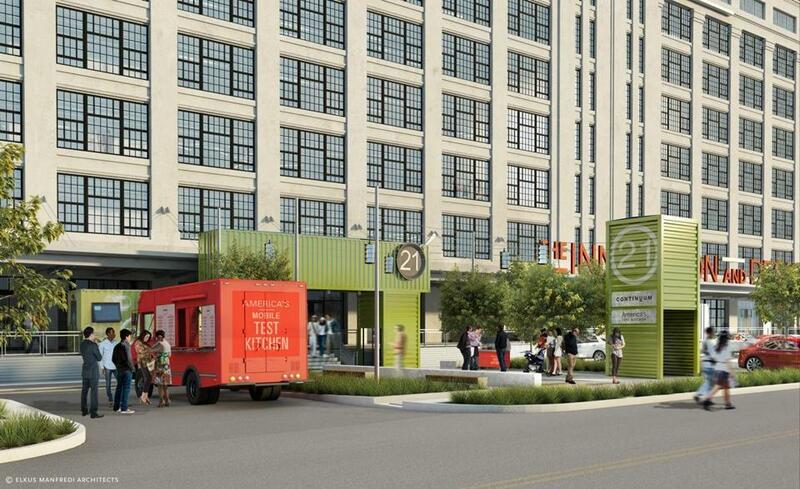 A rendering of the new America&apos;s Test Kitchen headquarters in the Innovation and Design Building in the Seaport District. After two decades in Brookline, there may finally be too many cooks in America’s Test Kitchen. On Wednesday, the media company, which publishes Cook’s Illustrated and produces popular cooking shows for public television, announced plans to leave its Brookline Village headquarters and relocate to a larger, 55,000-square-foot space in the Seaport’s Innovation and Design Building next summer. The move is being heralded as a sign of growth for ATK, which now has more than 200 employees and produces the most popular live cooking show on television. The company says it plans to launch new programming, podcasts, videos, and recipe content out of the space. And it’s another win for the building’s developer, Jamestown Properties, which has slotted a host of new tenants into the renovated design building since taking over its lease in 2013. ATK’s new location will be nearly twice the size of its current home. The Brookline space, despite undergoing a major renovation in 2014, has largely remained the same for nearly a decade, said Jack Bishop, the company’s chief creative officer. As the staff has grown over time, the kitchen has gotten increasingly crowded, particularly during the three weeks each May when the Cook’s Illustrated testers have to cede the stovetops to the “America’s Test Kitchen” film crews to produce a year’s worth of television shows. The Seaport location will provide more than 15,000 square feet of hands-on workspace spread out over a single floor of the building. Plans call for at least four state-of-the-art kitchens, three of which will be used to film “America’s Test Kitchen,” “Cook’s Country,” and the forthcoming new “Cook’s Science” television show currently in development. The fourth kitchen will be a large shared space where the “tastings and testings team” will set up its equipment to suss out the best recipes and kitchen gadgets. The company says the new space will also help it to better engage its fan base. “I’m really hoping that we can run some tours and invite people to tapings and food testings,” said David Nussbaum, ATK’s chief executive. A physical move is the latest in a series of big changes at ATK. The company had to find new hosts for its popular flagship cooking show after its founder and public face, Chris Kimball, announced that he was severing ties with the brand last November, citing creative differences. Kimball has since launched his own culinary-driven media company, Milk Street Kitchen, and opened an office in the old Flour and Grain Exchange building at 177 Milk St. in downtown Boston. Kimball maintains a minority ownership in ATK but will end his role hosting the “America’s Test Kitchen” radio show in October, said Nussbaum. Nussbaum said that the Seaport location will create new opportunities both for the company to expand its offerings and for the public to consume them. The most visible manifestation will be a new ATK-branded food truck that will park outside the building, offering local startup employees and designers a sampling of the experiments underway upstairs. He said he intends to continuing hiring new employees to build a more robust digital team, and has partnered with Facebook and the news and entertainment website Mashable to produce a series of Facebook Live videos on kitchen hacks and holiday food prep that will begin airing this fall. ATK is one of several new tenants in the Innovation and Design Building, a 1.4 million-square-foot complex that once served as a military depot on the south side of the Seaport District. The software design firm Autodesk opened its East Coast operations in the building last fall, and the Continuum design group relocated there from West Newton in June. Jamestown Properties has spent over $100 million retrofitting the building. “There are few companies with the dynamism of America’s Test Kitchen that contribute to the media culture the way they do and we are fortunate to have them at the Innovation and Design Building,” Michael Phillips, chief executive of Jamestown Properties, said in a statement. Nussbaum said Jamestown Properties’ experience with urban food hubs excited him about moving to the new site. Jamestown has had a hand in developing Chelsea Market in New York City, another mixed-use building that houses media outlets and is home to a thriving marketplace on the first floor. The company also announced on Wednesday that it was partnering with Holland America Line to outfit all 14 of its cruise ships with ATK-approved kitchens. Bishop, the company’s chief creative officer, said ATK is currently in the midst of offering boot camps to a team of onboard chefs who will offer live demonstrations and tastings to passengers on the cruise line. The new office’s proximity to the Black Falcon cruise ship terminal was purely coincidental, he said. But it bodes well for the company’s expansion plans. The first ship with an ATK setup departs from Vancouver this October. 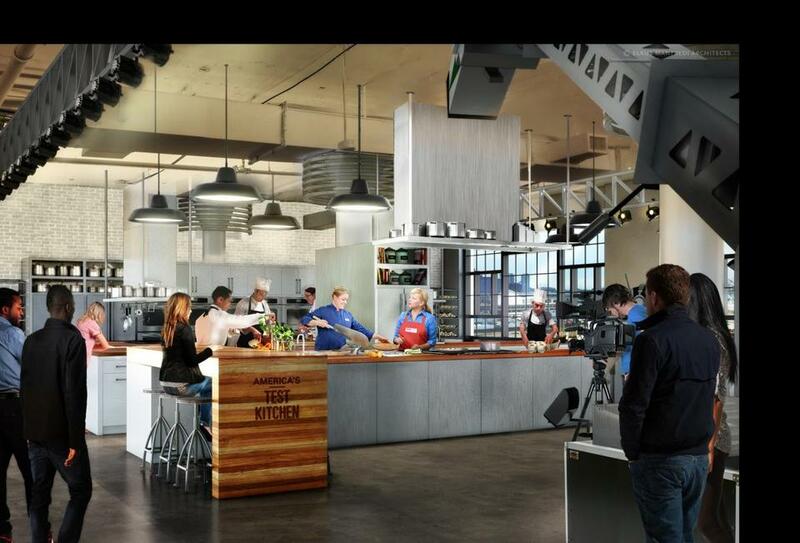 A rendering of the interior view of the new America's Test Kitchen location in the Seaport District. Correction: An earlier version of this story misidentified the source of the renderings. It is from Elkus Manfredi Architects. Additionally, Continuum’s home before the relocation was misidentified. It was previously in West Newton.